UK, 2015, 180 minutes, Colour. Martin Clunes, Asher Ali, Charles Edwards, Art Malik, Hattie Morahan, Emma Fielding, Alan Mc Kenna. 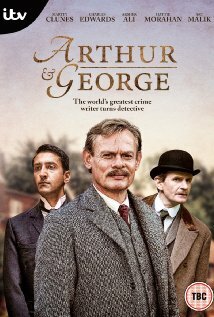 Arthur and George is based on the 2005 novel by Julian Barnes. This is a story of Sir Arthur Conan Doyle, making him resemble Sherlock Holmes in some way. He lives in the country, grieves the death of his wife, is in a relationship with a friend, Jenny Leckie, whom he marries. A local case comes to his attention, a British Indian has been in jail for several years, son of the local vicar, a quiet man, a solicitor, who is accused of mutilating horses and found guilty. He was also accused of writing poison pen letters. Doyle takes up his case, introducing into the British legal system the Court of Appeals. The film is based on a true story but dramatises the facts. The series offers a plum role to Martin Clunes, best known for television series including Men Behaving Badly, and Doc Martin. Asher Ali is George, the accused, with Art Malik as his father. Charles Edwards portrays the assistant to Doyle – somewhat akin to Dr Watson. The series was directed by Stuart Orme, director of the television films in the Irish Jack Taylor series. 1. The popularity of Conan Doyle? The greater popularity of Sherlock Holmes? This story of Doyle has Holmes? 2. The adaptation of the novel by Julian Barnes? The conceit of establishing Doyle in the Sherlock Holmes situation? Doyle, his life, the death of his wife, Louisa, his attraction towards Jean Leckie, eventually marrying her? At home, his lifestyle, his mother? Wood as his secretary? The Doctor Watson function? The case, seeming injustice, his investigation, solution? Defending the innocent? His actual contribution to the issue of Criminal Court appeals? 3. The countryside, very Sherlockian – no Baker Street? The lush photography? Exteriors, the countryside, interiors? Early 20th century? The musical score? 4. Martin Clunes as Conan Doyle, the British cast? 5. The plot, the opening with the horse and impaling, the case, Arthur and his having been convicted, in jail? 6. The portrait of Doyle, his age, the country gentlemen, at home, with Wood, with Jean? Not having enough to do? 7. The crime, the accusations, Arthur, British-Indian?, his father the thicker, a meek man, accusations of the letters, the Staffordshire intolerance? Being taken to court? 8. Arthur, his background, his father the vicar, wife, other as a solicitor, meek? (In real life not guilty of mutilating the horses – but the suspicions of his writing the letters). 9. The role of Wood, cricketer, sounding board for Doyle? 10. Doyle, social life in Staffordshire? The relationship with Jean Leckie, his domestic life? His involvement in the justice, law? 11. The film as very Sherlockian?